The A-Designs Audio EM-Red is the “mid-forward” preamp of the EM family. 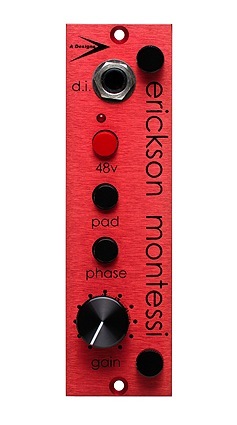 Its sound derives from the combination of an A-Designs proprietary input transformer featuring a unique winding, and a 50/50 steel/nickel-wound output transformer (also a proprietary A-Designs alloy). The EM-Red has the extra kick you need when you have a mic that lacks present mids (such as the mid-scooped Chinese capsules), or if you want to bring an instrument forward in the mix. The upfront mids of the EM-Red make it ideal for drums, guitar, bass guitar, and acoustic instruments. In fact, you will find the EM-Red particularly useful when recording acoustic guitar with a condenser microphone. It’s also great for bringing out the resonance and character of rack toms and floor toms.